1. Die cut out of white card stock 2 stitched rectangles. 2. Sponge in top corner with green distress inks and splatter with water. 3. 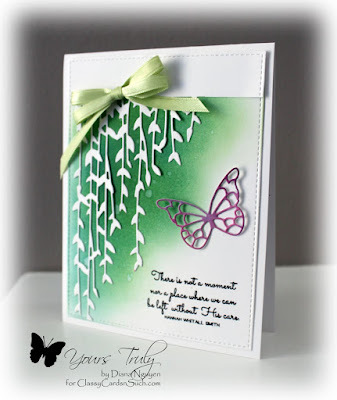 Die cut willow branch out of one of the stitched rectangles and extend the cut. 4. Add a die cut of the butterfly. 5. Stamp in bottom corner quote from God is and emboss in black detail embossing powder. 6. Add a green double bow. Gorgeous, Diana! Love the sponged corner!